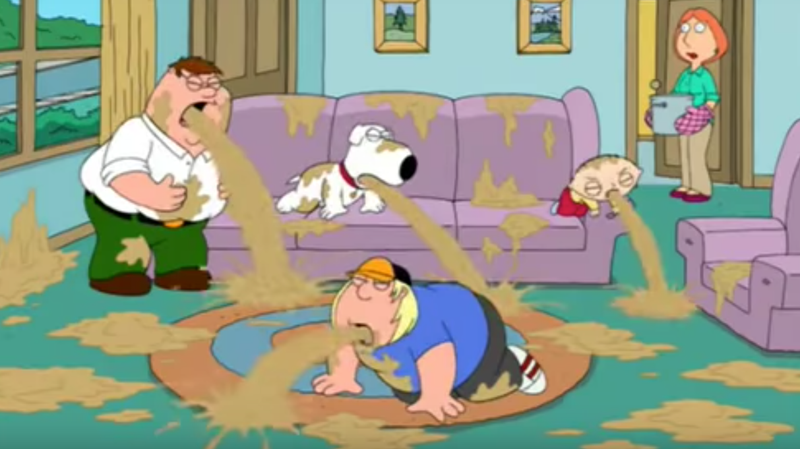 I’ve seen bouts of “sympathy vomiting” in cartoons like Family Guy and movies like Stand By Me and yeah, I don’t really want to search too hard for more examples. But I have never actually seen a person’s vomit inspire someone else to vomit in real life (although Allison Shoemaker has a horrifying story from her own grade school days). I mean, if I could live through my kids’ toddler years of almost daily spit-up and vomit without partaking, I had my sympathy vomiting doubts. But maybe I’m just immune. After all, Petree Elementary School in North Carolina recently saw a bout of mass vomiting that was caused “not by a nefarious disease, but rather fruit-flavored concentrate, spicy food and ‘sympathetic vomiting,’” says ABC Eyewitness News 11 in Raleigh-Durham. We’re a little stymied by the undiluted “fruit-flavored concentrate,” but apparently that combined with some spicy chips was enough to kick off a vomiting session that felled two dozen fifth-graders (and one adult). Here’s a sentence designed to strike terror in the heart of all parents: “Health officials say the students also practiced poor hygiene by sharing the food and liquid, the latter of which they drank from their hands, lunch trays and other ill-advised conduits.” Oh god. Can I get sympathy vomiting just from reading something on the internet? And my kids wonder why I remind them to wash their hands on a near-constant basis.